HomeLongevity – is it a new incurable disease? Longevity – is it a new incurable disease? If you care to look at the financial press, personal investment magazines or the information brochures published by superannuation funds, you could be excused for concluding that a new incurable disease has become entrenched in the community – longevity. The fear of living too long and running out of money in retirement is affecting more and more people, particularly in the light of weakening Government finances which are needed to pay for the age pension. Enormous volumes of papers and investment brochures, armies of financial advisors, whizz-bang calculators and projectors available on-line are all at work on the population. The message is almost always that Australians need to save more for retirement. People are constantly reminded of how long they are expected to live and how much money they will need to meet living expenses. However, funding a comfortable lifestyle in retirement is increasingly looking beyond the capability of the average person. The expectation of life of a 65 year old male in Australia is now just over 19 years and fractionally over 22 years for a 65 year old female, according to the Australian Life Tables 2010-12 recently released by the Australian Government Actuary. At the start of the 20th century, when the Government funded old-age pension was introduced in Australia, the expectation of life at age 65 was 11.3 years for males and 14.2 years for females. If life expectancies continue to improve, then at some point, it becomes impossible for the average household to fund retirement. The value of wages earned on a life-time of labour over a 45 year time-frame, say from age 20 to age 65, is simply not enough. If the retirement age is held constant at 65, the problem has no solution – it does not matter how much people are cajoled about saving more, the preference for food, clothing, shelter, medicine in the present will always be stronger than the preference for a greater superannuation balance that could be needed many years into the future. There is only one variable that is likely to have any sustainable bearing on the outcome of all this – it is the retirement age. There ought to be nothing sacred about retiring at age 65. 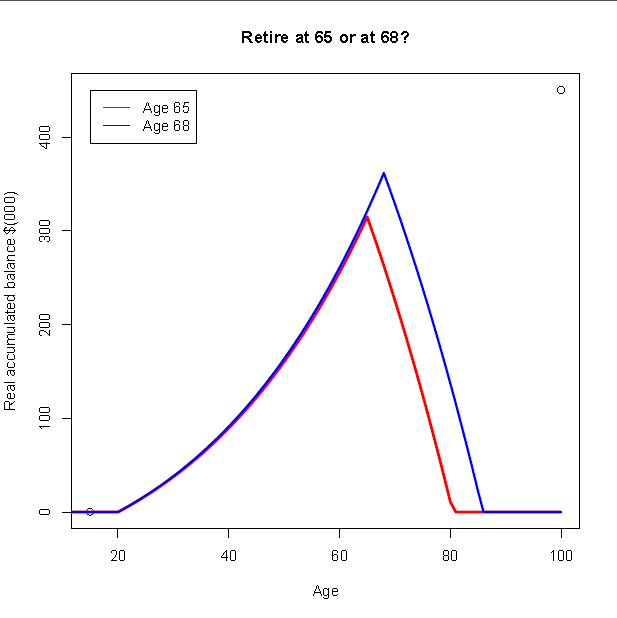 Retiring at the same age in the face of rising life expectancies is very expensive. In the chart below, I have projected two balances for the same hypothetical individual who starts work at age 20 on a starting salary of $40,000. Thereafter, his salary inflates at 1%pa real, he has contributions of 9.5% of salary paid, and taxed at 15%, investment returns are 2.5%pa real and in retirement he draws $25,000pa real. One individual retires at age 65 and the other at age 68. By delaying retirement for 3 years, the second individual can make their money last about 6 years longer than the first. Note that these two examples both show that contributing to superannuation over 45 years at 9.5% of salary and earning a real 2.5% pa investment return, with wages rising at 1% pa in real terms is not enough. Contributing an extra 3 years is enough, just. The number of people who can work 45 or 48 years unbroken with secure wages is questionable. Periods of time out of work because of sickness, accident, unemployment, raising children, caring for family members are all commonplace and they make the savings target so much harder to attain. So is longevity an incurable disease? It certainly makes the economics of life time income and consumption more tricky. If an individual’s lifespan increases beyond their economic useful life as a factor of production in the economy, things will get hard indeed. But remember, a cohort of retirees will see some die early, some die late and very few die at the average time. (See my earlier posts on the shape of mortality.) For those that die early, this is a moot point. For everyone else, get used to it. Longevity should be celebrated and enjoyed. But it needs mitigation techniques to fund that extra time. Those techniques must include keeping fit and healthy, keeping skills up-to-date and keeping open the expectation of working well past the arbitrary age of 65. If you are healthy, and economically contributing, then keep working.